Manufacturer & Supplier of Power Factor Correction Panel. Our product range also comprises of Control Panels, Electrical Control Panels and VFD Control Panel. 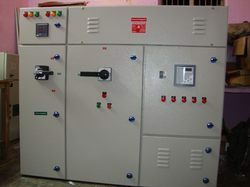 Being one of the reputed organizations in the market, we are engaged in offering a wide assortment range of Power Factor Correction Panel. These panels are designed to provide unmatched performance, reliability and versatility for critical Power Network applications. Offered panels are available on diverse specifications according to the needs of customers. They can either be automatic controlled through APFC relay or manually by observing the power factor.